David Starkey and Bendor Grovesnor have argued the case ( here ) for the night gown sketch being Anne. If the woman in the nightgown is Anne, then so is the woman in the hood when you compare them side by side. A line from my Anne Boleyn poem in the book Queen, Jewel, Mistress. 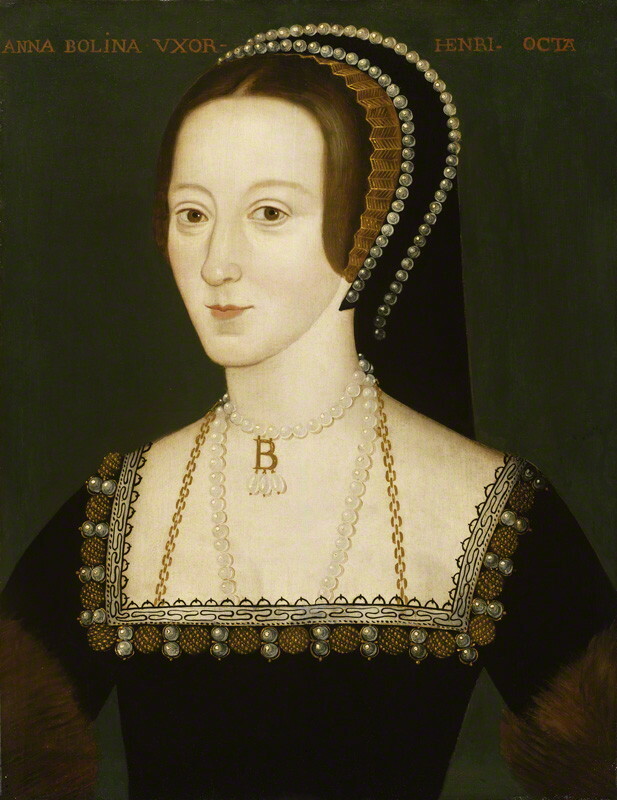 I loved writing about all those fascinating women, but Anne Boleyn was always my favourite. So agree. Also if you compare these with the National Portrait Gallery image of Anne wearing the B necklace you can also see a lot of similarities, especially if you add some colour to the sketches. Yes, the NPG has the same nose, chin…I would love to see the Holbein paintings that came from these sketches, the colouring of the skin, eyes. He could really capture the personality. One sketch the lady is proud, in the other she seems exhausted. But I think she is the same woman, just one could have been sketched when Henry was besotted and she was secure, 1532 perhaps and the other 1536, post pregnancy/after years of stress and intrigue. I love the mystery! This is a WONDERFUL resource! I’ve never seen such a good side-by-side comparison of the two sketches. Previously, I hadn’t believed the sketch in the gable hood to be Anne, but now that I see them together, I agree with you that it’s almost certainly the same lady at different stages in her reign. Bravo! This link is the painting at Hever Castle based on the gable hood sketch. Ruth, this was a great idea and you’ve done an excellent job. I was utterly sure that the drawings depicted two different women, but I have to say… I’m not as certain as I was. The bridge of the nose is more pronounced in the Windsor Holbein, but still it’s a beguiling argument. When I fell in love with Anne as a subject, I was sure the BM sketch depicted Anne as this image reflects the confident, feisty image I have of her. However, the Windsor sketch looks much closer to the Moost Happi medal. This is generally not the image that ‘Anne Boleyn fans’ want of Anne as she is not a beauty here (though nor was she in contemporary descriptions). Nevertheless Eric Ives stated that such a commemorative medal could only have been produced by royal command, and so one can suppose that Anne (who was known to be take great care in how she presented herself), was happy with this contemporary portrait. 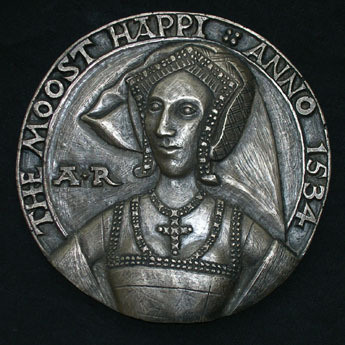 Anne was pregnant when her portrait was shown on the Moost Happi medal and this no doubt accounts for the great emphasis that is made of her breasts, which were noted for being ‘not much raised’. It may well be that the Windsor sketch shows Anne during one of her later pregnancies, displaying increased weight and fatigue. In any case, thank you Ruth for this lovely visual experiment, it’s beautifully done! Lucy, I really appreciate your thoughts about the comparison. I stood in front of the BM sketch at the Holbein exhibition and it such a beautiful thing. And you are drawn to the woman’s eyes: Holbein really emphasised them like they were her most arresting feature. It’s the comparison of the eyes / brows that convinces me it’s the same person. The lady’s eyes are just so blue though…Anne’s eyes were described by contemporary viewers as ‘dark’ , which I presume would be brown. And blue eyes don’t often come with the slightly swarthy skin that she was said to have had… .. I agree, the blue eyes are wrong. I can only think the wash of colour was added later. I’ve been saying this for years. The Holbein drawings are the same woman. It is obvious. (They are ALL the same woman by different artists done in different media.) My only disagreement is that the gold color on the nightgown sketch is part of the cap–in that case it is not. This is not really an issue for a number of reasons: first, many of Holbein’s sketched here over drawn and over painted by others later on. This yellow wash might be the result of this; it may have been another color that has since faded, if it is original; and most importantly, there is no first-hand description of Anne Boleyn as black haired, or even dark haired. The image of her mother that Elizabeth commissioned for her ring has red hair and I submit that Anne very probably had reddish air, too. The only thing we know for sure about Anne is that she was ‘not one of the handsomest women in the world. She is of middling stature, with a swarthy complexion, long neck, wide mouth, bosom not much raised, and in fact has nothing but the King’s great appetite, and her eyes, which are black and beautiful.” No other person who saw her while she was alive ever described her as having black or even dark brown hair. Ann, I think you are right about the red hair. Certainly the ring had a woman with auburn hair. Wyatt’s muse was a ‘brunet’ but that could be all shades of brown, chestnut, red. Just not a blonde. I agree the wash could have faded or been painted over later by an over zealous apprentice. I thought it looked like fabric and too golden to be blonde hair (more like but on closer inspection there does seem to be strands sketched in. If it is hair, I love the informal quality of this drawing. It is very intimate; so relaxed, in her nightclothes. Perhaps only a queen could be so daring? 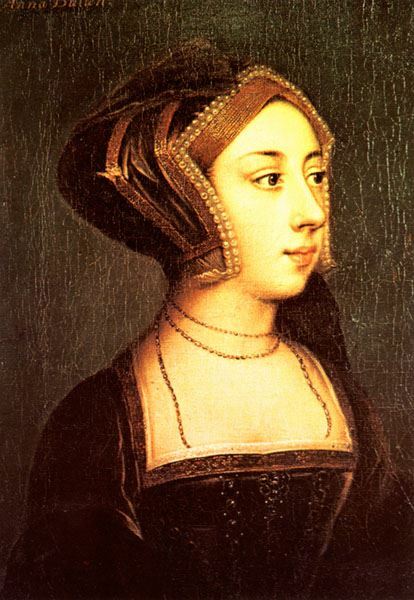 “Speculation about Wyatt’s relationship with Anne Boleyn has gone on since Elizabeth’s reign, with numerous autobiographical references proposed in his writing. In fact, Wyatt refers to Anne in only four genuine poems. The clearest is ‘If waker care, if sudden pale colour’, written after he had fallen for Elizabeth Darell, whom he calls Phyllis: ‘If thou ask whom, sure since I did refrain Brunet that set my wealth in such a roar The unfeigned cheer of Phyllis hath the place That Brunet had: she hath and ever shall.’ That Anne was Brunet is clear because the correction shows that Wyatt originally wrote ‘Her that did set our country in a roar’. 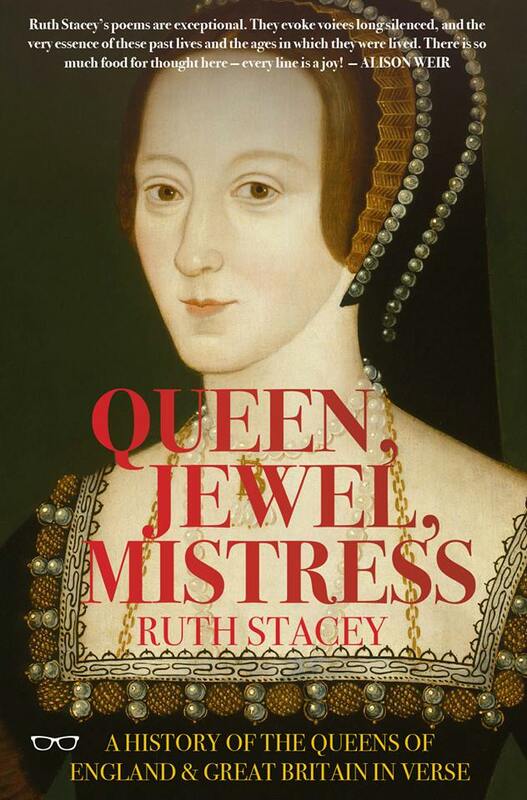 I know the photos don’t picture her as beautiful, yet Cavendish described her as a beautiful lady, he was one of the few who saw her in real life, and wrote a book, about the life of Wolsey.This of course would in include Anne, since she and Wolsey weren’t friends in the least. Except that figure 2 appears to have blue eyes and I don’t think Holbein would have changed them. Check out Ambrosius Bensen’s “Elegant Couples Dancing”. The dancer to the right looks a lot like Figure 1 and is, interestingly, not dancing with the male figure that resembles Henry. I think it was painted in the 1540’s and might be a subtle inference (if it actually represent English couples) that Anne’s interests were elsewhere. An additional note: Anne has been portrayed in many portraits with protruding eyes – probably from the slander “goggled eyed whore”. But “goggle” in the 16th century meant “squinty”. Her eyes were dark – but not necessarily huge – as Figure 1 supports. 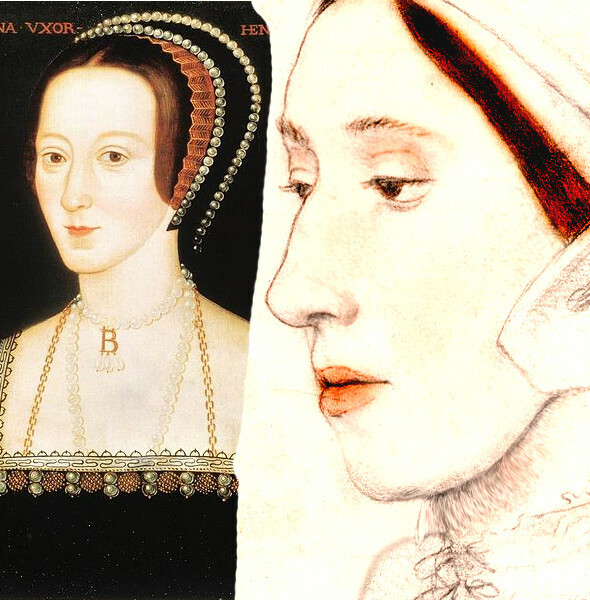 I would love to believe that the two Holbein sketches show the same woman, but no, the noses are completely different as are the brows and shape of the lips. Too different. It could be that neither of these sketches are Anne; art historians suppose that the descriptive text was added over a century later. Also, Anne was described by more than one contemporary as having very dark eyes. I am a little late to leave a reply, but I felt compelled to write something after viewing this post. This side by side comparison has left me quite certain this is the same woman. I have always believed, for the same reasons David Starkey and Bendor Grovesnor have argued, that the Windsor sketch was Anne. After seeing this post, I now believe the BM sketch is a younger Anne. 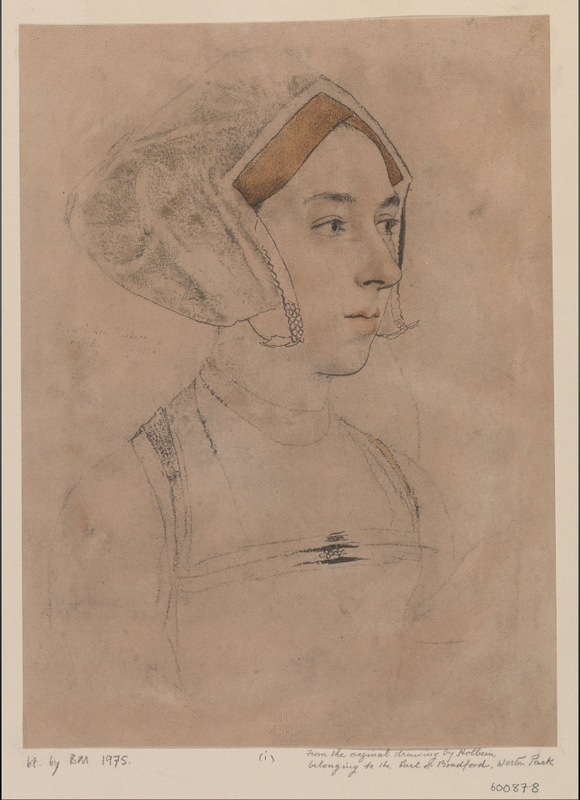 Holbein spent two periods of his life in England (1526-8 and 1532-43), so perhaps the BM sketch shows Anne as she was around 1528 when Henry was besotted and she was secure in his affections, and her confidence was evident (as many contemporary sources imply). The Windsor sketch could depict Anne in 1536, pregnant for the third time and less secure in the King’s graces. I know I look slightly different than I did 8 years ago. The fundamental likeness is there, however, in both sketches – the brow, chin, cheeks, lips. The eye color could have been modified over the years as well, but the eyelids appear the same. Thank you for this post! How intriguing! Leslie, thanks for commenting. The two date periods Holbein was in England would match the different stages of her life (which reflects in the two sketches) so thank you for pointing that out. I think the likeness is very close, taking in the fact one image is more profile and different moods (pride and melancholy/tiredness). 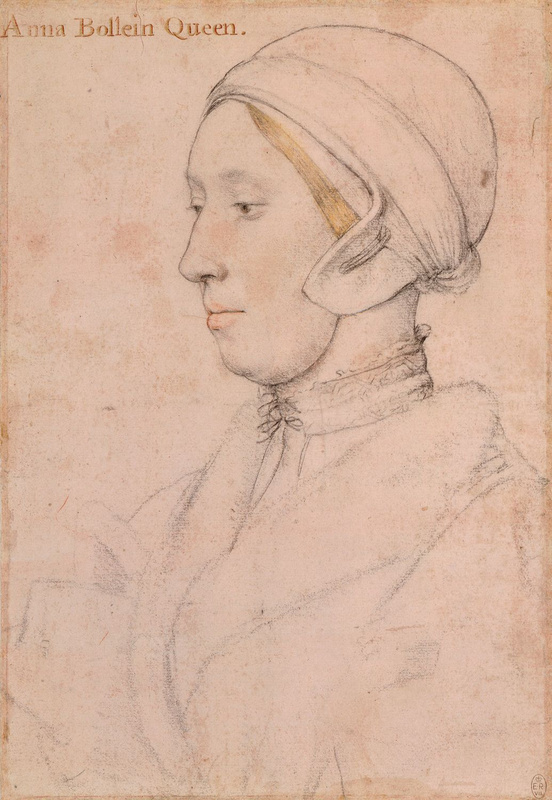 Holbein’s ‘The Duchess of Suffolk’ appears to me to be the same lady as depicted in the ‘older’ Anne sketch. Also zu all dem gut und schön Anne war eine sehr Selbstbewusste Frau. Und sie wurde von Holbein öffter gemalt. Anne wurde als Dunkel beschrieben, aber nicht weil sie dunkle Haare und haut hatte sondern weil sie glaubten dass sie eine Hexe sei, die den König buchstäblich verführte um Missetaten in ihrem Auftrag zu begehen. Das Bildnisse von Anne wurde nachträglich geschwärzt. Um ihr Ansehen zu besudeln. Yes I agree with this. In the ring owned by Elizabeth, Anne was portrayed with golden red hair. Wyatt called her a Brunet, but that could describe anything except blonde.